Image: The August 30, 2017 Lunar Return of Donald Trump set for the White House (although who stays in DC in any given August?) 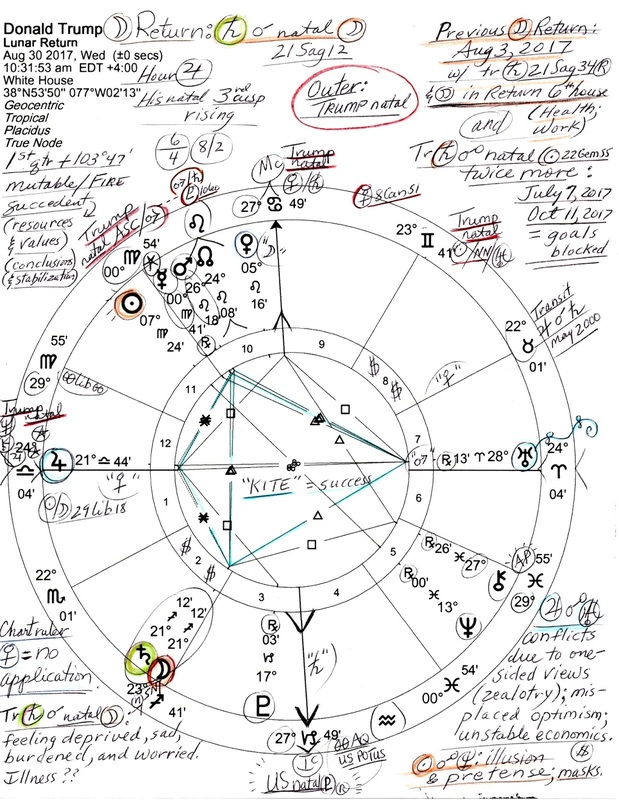 showing transit Saturn, a planet of karma (reaping what's been sown) hitting his natal Moon for the third and final time @21Sag12 in Return 2nd house of Money, Values, and Self-Worth; in Mundane Astrology 2nd house represents the National Treasury. 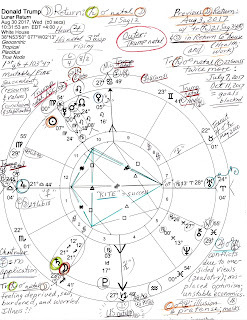 Note also that Saturn is within range of conjoining his natal South Node, a separative point, and has opposed Mr. Trump's natal Sun (22Gem55) on July 7, 2017. During this transit, Saturn has conjoined natal Moon twice before: December 30, 2016 and August 3, 2017. Considering Saturn's 28-30-year cycle, the last (previous) Saturn transit to natal Moon occurred once on November 25, 1987, a year when transit Jupiter opposed his natal Jupiter in Libra, a period of overblown enterprises and unflattering comparisons when resources may be lacking. Rolling Stone's Timeline of Donald Trump's life and career replete with Saturnian events. Exs: 1987 publication The Art of the Deal via a ghost writer to do the actual work of putting Trump's ideas into Saturnian form; January 1989 - first appears on the cover of TIME--and Saturn rules Time; separation from wife Ivana in 1990, divorce (official ending of relationship) in 1992; also in 1990 - Trump is deleted from the Forbes 400 list; 1991 losses result in first bankruptcy filing; March 2000 The Simpsons airs 'Bart to the Future' in which Donald Trump takes on the job of US president (age 53), etc. Now as you know, when transit Saturn hits natal Moon, it tends to bring feelings of loneliness, rejection, privation and denial of the usual comforts, and family/relationship issues so now that Mr. Trump is somewhat isolated in the White House with weightier responsibilities on his menu (and more open to hurtful criticism), such lowering feelings may be more difficult to handle to the point of his physical and/or mental health being affected (as some have noted--other astro-charts show an erosion of thought processes and disrupted communications but that's a brainy topic beyond the scope of this meager post). Plus, he is, after all, no spring chicken--and was a mere 41 years old in 1987, wasn't noticeably forgetful, and spoke more clearly in complete sentences. But he just had to play president and thought it would be easier! (He expected the easy Jupiterian side of the White House, not the hard Saturnian side). So with curious synchronicity, the Universe sees fit to pile a Lunar Return onto his noggin on the same day that transit Saturn stomps upon that very Moon position--and in a calendar month when two Saturn-infused Lunar Returns occur (August 3rd and 30th). Will Saturn's imperative lessons of maturity, accountability, soberness, authenticity, honesty, concentration on tasks at hand, and serious efforts 'get through' to Mr. Trump in his role as leader of the 'free world'? Or will he continue to brood and chafe under the presidential work load that universal task master and lesson bringer, Saturn, demands? Well, we know that he and the American people must make it through a long hot summer and navigate whatever comes via The Great American Eclipse of August 21, 2017 @28Leo52, visible from West Coast to East. Its degree conjoins Mr. Trump's natal Ascendant, as we've discussed previously, and affects his natal Mars as well (26Leo46). In fact, on August 31, the day after this Lunar Return, Mr. Trump has a Mars Return, signifying the start of an energizing two-year cycle of new activities and projects. Yet even a Mars Return can have some negativity attached because fever, inflammation, infection, or even surgery may follow if other planetary and health factors agree. And yet 2017 is, on some levels, a year of Jupiterian protection for Mr. Trump via the third of his current Jupiter Return, a three-fer which perfects for a final conjunction on August 4, 2017 (@17Lib27). But even this rewarding Return chart shows an ongoing difficulty in effect all year--transit Pluto squares natal Jupiter (0A04 on August 4th!) denoting a time when over exaggeration, bombast, and the overestimation of self-importance is unacceptable to the powers-behind-the-throne. Frustration mars politics, diplomacy, financial projects, and other Jupiterian expansion areas which must on some level include the granting of funds for the building of a Saturnian border wall.